If you’ve worked at a wastewater treatment plant for any length of time, you’ve probably gotten used to the little noises and surprises that come with the equipment and flows constantly rushing around. Those of us who worked the night shift know these noises can sometimes take on new characteristics. With Halloween fast approaching, I’ve been reminiscing about some of the spookier aspects of my early and more adventurous operator days (er… nights). In case you’ve never experienced water hammer directly, it occurs when fluid in a pipe system suddenly stops or violently changes direction, causing the pipe to rattle, shake, or ‘knock’. In extreme cases, water hammer can cause serious damage to pipes and pipe supports. You may have seen this in old movies when the actors shut off the faucet in a high-rise building and the pipes rattle inside the walls; the shutting of the faucet (valve) and sudden stop of flow combined with the high pressure the water pipe is under is the cause. This can also occur in your wastewater plant when automated valves stop or a pump shuts off – solenoid valves with their abrupt opening and closing are notorious for causing water hammer. When this unexpectedly happens, beware, you may jump. So were those pipes suddenly and unexpectedly knocking at 1 a.m., or do I need to get my zombie apocalypse kit out? The warning signs on automated equipment are for your safety; you don’t want to stick your hand into something that might turn on without warning. Speaking from experience, those signs do little for your health when your heart skips a beat as the machine turns on breaking the dead silence. The plant I worked at serves a Big 10 university, and some students don’t stay up late just to study. The primary treatment area of our plant sat low on the terrain and was surrounded by earthen flood dikes about fifteen feet high, which naturally bounced sounds along unexpected pathways. One night I spent so much time trying to figure out where the voices were coming from I started to think I needed to see a professional… only to discover some night-owl students smoking in the woods near the plant’s outer fence. From the speed at which they took off when I came around the corner with my flashlight, I think I scared them more than they had scared me. We would manually skim our primary clarifiers once every four hours. The job required spending 20-30 minutes watching the skimmer remove the collected grease and other floatables. We had to make minor skimmer adjustments to keep the skimmer tube from sinking and suddenly filling faster than the scum pumps could cope with. A private rail line bordered the plant to the north where train cars would sit idle for hours -- sometimes days. A wastewater treatment plant can be mighty peaceful at 3 a.m., surrounded by the quiet sound of mini waterfalls, watching the scum on the primaries go bye-bye, and putting more effort into staying awake than anything until PSHSHHSHH - 30 train cars simultaneously released their air brakes! I almost jumped over the handrail standing flat-footed; the perfect substitute for coffee when you have to get through the rest of an otherwise long, quiet shift. The tool cage was creepy enough at night without noises. We’d keep most of the garage lights off to save electricity. Picture a large, shadowy steel cage filled with parts resembling a mad professor’s laboratory, pipe racks that would make the perfect place for a ghoul to jump out from behind, and the steady, low hiss of the leaking air compressor hose. When you throw in a couple of mice that suddenly decide to knock over a broom, you can’t escape the garage fast enough. So, maybe working at a wastewater treatment plant, even on the night shift, wasn’t that spooky and was actually pretty fun. The really scary part of the job comes from upset clarifiers, chlorine pump failures, overheating blowers, and preparing your MROs for submittal to IDEM. To learn how to differentiate between a little scare and when the noises at your plant are indicating serious problems, download our WWTP Operations 101: Operating Data Guide e-book. 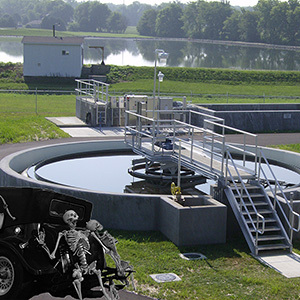 May your wastewater treatment plant be free of knocking pipes, noisy mice, and ghosts this Halloween!